Soldiers from the 22nd Maine Regiment were from Bangor and its many surrounding towns. The regiment mustered from Bangor on October 10, 1862. The soldiers were trained for only one day in Washington D.C., so they were fairly unprepared. Eventually, they were stationed in St. Martinsville, Louisiana. The different battles of the 22nd Maine include Bayou Teche Campaign, also known as the Battle of Irish Bend which occurred on April 14, 1863 and the Siege of Port Hudson as well. The 22nd Maine Regiment consisted of ten companies and one-hundred people were in each company; thus, there were approximately one-thousand people in all. Nine were either killed or severely wounded and 160 died of disease. Around 180 soldiers died total. Simon G. Jerrard was the commander of the 22nd Maine and was also a selectman in Levant and a Penobscot County sheriff. The majority of the soldiers returned to Bangor on August 13, 1863. Bangor residents in other Maine Company's like Pvt. Alden Ellis, Lieutenant George Anson and George Varney did not return with their "muster mates." They were captured and sent to prisoner of war camps, Libby and Andersonville Prisons. Colonel George Varney, a resident of Bangor, Maine, was taken prisoner on July 27th, 1862. He was commander of the 2nd Maine Volunteer Infantry. He was captured in two battles in the Civil War, was exchanged both times, and spent time in Libby prison as a prisoner. 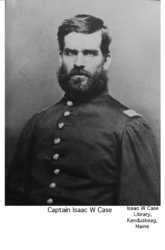 He also suffered a head wound in the Battle of Fredericksburg. Libby prison was located in Richmond, Virginia. Ironically, Libby prison was named after Luther Libby who was a Maine native. It was a four-story building containing eight rooms in which the men slept on the floor. There was little light. There was overheating in the summer and it was very cold in the winter. Throughout the war overcrowding, disease, and hunger plagued the prisoners. 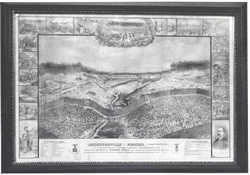 Andersonville Prison Above is a sketch of Andersonville Prison as it appeared on August 1, 1864 when it contained 35,000 prisoners of war. It was drawn from memory by Thomas O'Dea, who was from the 16th Maine Regiment. Item contributed by the Bangor Museum and Center for History.